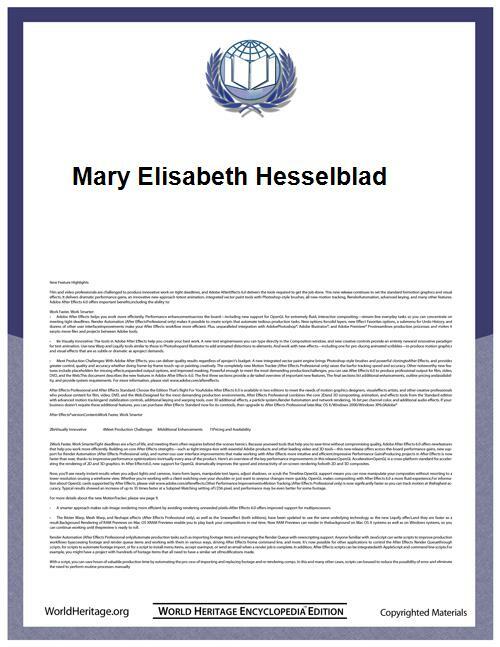 The Blessed Mary Elizabeth Hesselblad, O.Ss.S. (or Maria Elisabeth Hesselblad), was a Swedish nurse who was a convert to the Catholic Church and founded a new form of life of the Bridgettines. She was beatified by Pope John Paul II. She was the fifth of 13 children born to August Robert Hesselblad and Cajsa Pettesdotter Dag – a Lutheran family in Fåglavik in Västra Götaland County. By 1886, she had to work to help them make ends meet. At first she looked for work in Sweden, but eventually sought emigrated to the United States in 1888, where she studied nursing at Roosevelt Hospital in New York City. While there, she did home nursing, which brought her into contact with the Catholic faith of many of the poor for whom she cared. She developed an interest in that faith, and on 15 August 1902 she was baptized conditionally by a Jesuit priest, Giovanni Hagen, in the chapel of the Convent of the Visitation in Washington, D.C.
Hesselblad then made a pilgrimage to Rome, where she received Confirmation. She also visited the House of St. Bridget of Sweden there, where the medieval saint had spent the last half of her life, which made a deep impression upon her. At that point she felt called to dedicate her life to the work of Christian unity. She returned to New York briefly, only to go back to Rome, where, on 25 March 1904, she was welcomed as a guest by the nuns of the Carmelite monastery housed there. She petitioned the Holy See to be able to make religious vows under the Rule of the Order which Brigid had founded, and had been a prominent presence in the Church in Sweden before the Protestant Reformation had taken hold there. She received special permission for this from Pope Pius X in 1906, at which time she assumed the Bridgettine religious habit, including its distinctive element of a silver crown. Hesselblad attempted to revive interest in the Order and its founder in both Sweden and Rome. Her proposal to establish a monastery of the Order on the site where Bridget had lived received no volunteers from the few monasteries of the Order still in existence. Giving up on the intention of following the established way of life in the Order, she proposed one which included the care of the sick. To this end she was joined by three young women from England, whom she received on 9 November 1911, with which the new congregation was established. Their particular mission was to pray and work, especially for the unity of Scandinavian Christians with the Catholic Church. Hesselblad returned to her homeland of Sweden in 1923, where she was able to establish a community in Djursholm, while she worked nursing the sick poor. The new congregation was established in England in 1931. That same year, Hesselblad obtained the House of St. Bridget in Rome for her new congregation. A foundation was made in India in 1937 which drew many new members. Hesselblad also worked at efforts at inter-religious dialogue and against racism, and became known as "the second Bridget". Hesselblad was beatified by Pope John Paul II on April 9, 2000. She was recognized by Yad Vashem in 2004 as one of the Righteous Among the Nations for her work in helping Jews during World War II. Agneta af Jochnick Östborn: For Sweden, I have given God my life! Elisabeth Hesselblads calling and Birgittine mission in Sweden, Artos, Skellefteå 1999. Called to Holiness: Blessed Elizabeth Hasselblad, Catholica, Vejbystrand 2000. Lars Cavallin: "Mother Mary Elisabeth Hesselblad OSsS from Fåglavik - pioneer of modern monastic life in Sweden" in Johnny Hagberg (editor): Monasteries and Monastic Life in the Medieval Diocese of Skara, Skara County Historical Society 2007. Marguerite Tjäder: Mutter Elisabeth - Die neue Blüte des Ordens saints Birgitta . EOS-Verlag, Sankt Ottilien 2002, ISBN 3-8306-7116-4. J. Berdonces, Hesselblad, Maria Elisabeth, in Dictionary of the institutes of perfection, vol. IV, Pauline Editions, Milan, 1977, coll. From 1530 to 1531.